Top Trumps brings us Top Trumps and Lexicon-GO! games! They are fast-paced, competitive card games, that are easy for anyone to pick up and enjoy. Not only are they fun, but are great tools for teaching. Top Trumps has a wide variety of packs on different topics so there's sure to be a pack for you! Plus, you can have as many players as you want so no one is left out of the fun. Lexicon-GO! is a super-fast word game. Race against other players to get rid of all your playing card tiles by creating words, swapping letters and even attacking other players’ words. Tryazon will select 100 hosts for the opportunity to join the fun. Those chosen will receive four different versions of Top Trumps games and the Lexicon-Go! game to play at their party. Learn more about the game and party by clicking the tabs below! About Top Trumps & Lexicon-GO! Top Trumps has been a best-selling game in England since the 1970s, with over 80 million packs sold in the last 10 years alone. Part of the game’s success has been through its role in education, with Top Trumps forming a part of teacher learning plans throughout the UK.In 2011 the National Children’s Bureau in England carried out research into the role of Top Trumps in education. It found that Top Trumps improves children’s literacy and numeracy skills, while also enabling them to practice their decision making abilities. For the full report from the NCB, please click here. -	In the 1970s, Top Trumps was launched by Dubreq, the makers of the stylophone. -	In 1982, Top Trumps was acquired by Waddingtons. -	In 1994, Top Trumps was acquired by Hasbro, and licensed by Winning Moves. 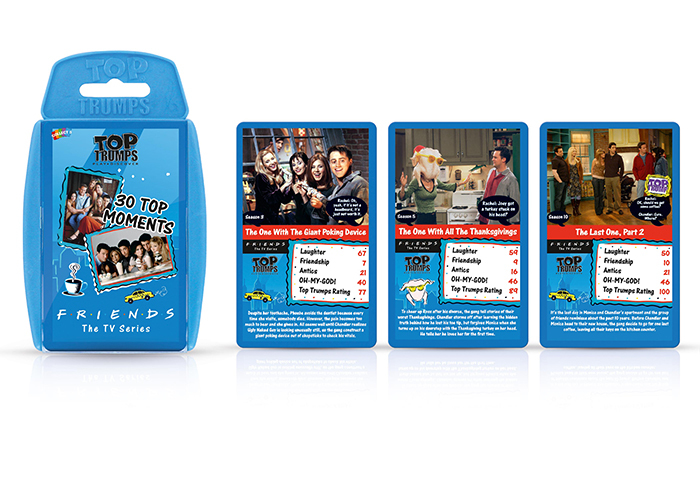 -	In 1999, Top Trumps was acquired by Winning Moves. -	Lexicon-GO! is a word tile game made by the brand ‘Waddingtons No.1’. -	The brand ‘Waddingtons No.1’ was founded by John Waddington in England in the 19th century. -	In 1922, Waddingtons went in to game production due to a high demand for playing cards during WW1. -	In 1934, Waddingtons published Monopoly and went on to create games such as Cluedo, Risk, Top Trumps and Lexicon. -	In 1994, Waddingtons was bought by Hasbro. -	In 2002, Winning Moves bought ‘Waddingtons No.1’ brand of Playing Cards and Lexicon. -	In 2018, Lexicon-GO! was born. Any number of people can play Top Trumps, that’s what makes it the world’s coolest card game! 1. Shuffle and deal the cards face down. 2. Players pick up their cards and look at their top cards only. 3. Player 1 (left of dealer) chooses and calls out their best stat (e.g. 'Dark Side - 6'). 4. The other players see if they can beat this stat (Highest number wins). 5. The card with the highest stat wins all of the top cards and adds them to the base of their pile. 6. The winner of the round chooses the stat for the next round. 7. The first player to get all of the cards wins! 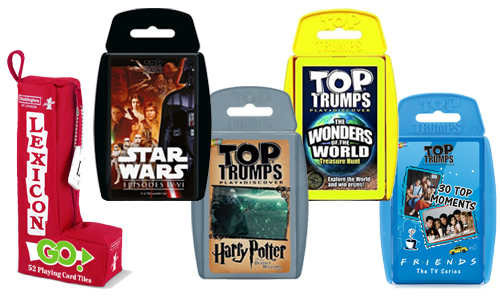 Prepare to outsmart your opponents and discover new facts with the best-selling set of UK games, @toptrumps! In addition, try out Lexicon-GO, a fast-moving word game, perfect for families and friends! The application period has now ended. Please check out our other Party Opportunities. All party host applications need to be received by this date. Applicants will receive notification by email by this date. Those party hosts who are accepted and confirmed will have their party packs shipped to them. Hosts can begin planning for their parties. Tryazon will provide party guides and resources to assist! The fun begins in October, when parties will be hosted! Tryazon will select up to 100 hosts for this party. Great game for kids... they learn SO much.